Is there an ideal way to cook Unico pasta? Can oil be added to the water while the pasta is cooking? What does "al dente" mean anyway? What is the difference between Unico's lasagna and oven-ready lasagna? What is the major difference between pasta and noodles? Q1. What is durum semolina? Ans. To ensure that our pasta is of excellent quality and tender in texture, durum semolina flour is used. It is made from protein-rich durum wheat, which is then broken down further to make semolina granules that are mixed into the pasta dough with water. Durum semolina is essential in our pasta producing process. Q2. 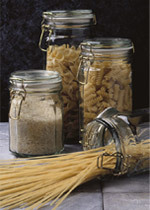 How long can dried pasta be stored? Ans. As long as the packaged pasta is kept in a dry place, unopened, it will last for several years. A common acclaim of pasta is in fact, its durability. Once the package is opened, it should be tightly resealed and placed in a cool, dry place away from any other foods that may spoil. Q3. Is there an ideal way to cook Unico pasta? Ans. We generally recommend that 4 liters of water be used for every 450 grams of pasta to ensure that the pasta is cooked consistently. Once the water boils, add the pasta and stir occasionally until your pasta of choice reaches a desired tenderness. Salt may be added to the boiling water and can also help to prevent the water from 'boiling over'. Once the pasta has reached a desired tenderness, drain it in a colander and place it on a warm platter. The rest is up to you! Q4. Can oil be added to the water while the pasta is cooking? Ans. We recommend that oil not be added to the water while the pasta is cooking because it prevents the sauce from coating the pasta when it is later served. However, if you are worried about your pasta sticking during the cooking process, a drop of oil may be added to the water. Q5. What does "al dente" mean anyway? Ans. Literally translated from Italian, "al dente" means "to the tooth". It is used to describe pasta that is cooked for a shorter period of time, resulting in pasta that is firm but still tender. Most Italians argue that this is the only way to properly enjoy pasta! Q6. What is the difference between Unico's lasagna and oven-ready lasagna? Ans. Regular lasagna noodles require pre-cooking before they are used in a casserole. Oven-ready lasagna noodles are quicker to prepare and can be added to your recipe straight from the package; they cook in the sauce while your casserole is in the oven. Which one you use depends on the amount of time that you have to prepare your dish! Q7. What is the major difference between pasta and noodles? Ans. Pasta is made from durum semolina flour and water; noodles are made from ordinary flour, water, and eggs to develop their firm texture.